You’re running a small business and ‘strategy’ is just for the big players, right? Well, maybe it’s time to think again argues Chris Harland. It really doesn’t matter what size your business is. We all have short-term objectives and longer-term goals, which means that every company can benefit from developing a strategy. It’s all too easy to drift or find that you are constantly focused on the day-to-day firefighting which becomes an inevitable part of running any enterprise. But what if there are long-term issues you need to solve or ambitious plans that you harbour for the future? Your strategy will be a way of cementing your vision and turning it into a mission. So what’s the best starting point? Some people like to begin with a SWOT analysis – which is where you identify your strengths, weaknesses, opportunities and threats. Imagine you’re running a local taxi company, for example. Your strengths may be the fact that people know your name in the local area and you get word-of-mouth recommendations. It could be, however, that you have a high turnover of drivers and struggle to find new recruits. That’s clearly a weakness. What about opportunities? Maybe you know that a big new employer is coming to town and there may be lots of regular taxi journeys with people travelling to and from their offices. But you’re also conscious of the threats posed by local competition and the huge growth in ‘ride-hail’ apps, such as Uber. It’s when you weigh up these different factors that you’re able to put your current business in perspective and start planning effectively for the future. 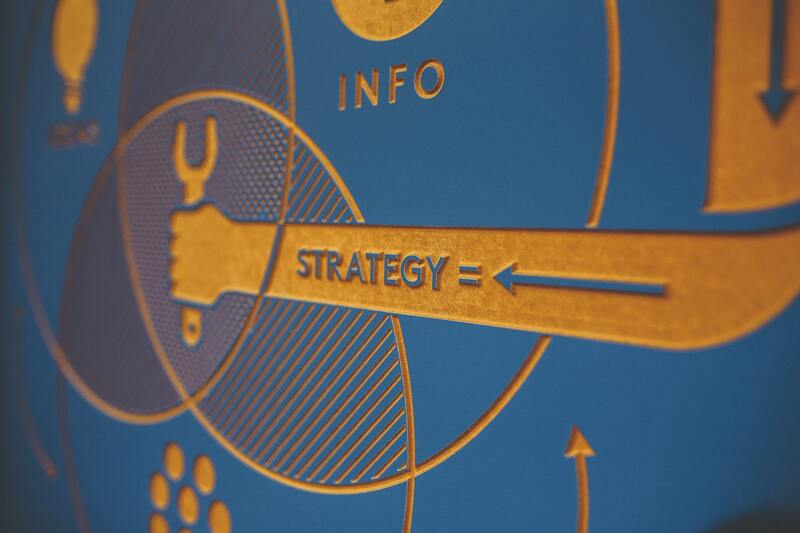 Inevitably, a business strategy will require clear targets and points of action. It’s there as a reminder of your ultimate goal and should map out the steps you’re going to take to get there. Perhaps you need to differentiate yourself in a crowded market place, for instance? You’ll need to spend time thinking about what makes your organisation, product or service unique and how this affects your strategy moving forward. You may need to change your processes and operations, but it might also be a question of rebranding your business or promoting your message effectively through marketing. And what about training? Perhaps your strategy needs to include a plan to provide staff members with new skills that will allow you to compete more effectively or break into new markets. Of course, the strategy only has a chance of success if you communicate your vision to members of staff, so that the business is well organised and co-ordinated in its approach. In a very small company, you might be able to do this by word of mouth, although when you have a larger workforce, you’ll have to consider other methods of communication. Once you embark on your journey together, it’s important to review your progress. A strategy is something that may change in response to events in your particular market or the wider world. You may also see that you’re finding it hard to achieve certain milestones and so there’s a constant process of adjustment and re-evaluation. Over time, you’re looking for evidence that your business is strengthening and that operations, sales, admin and other departments are all travelling in the same direction. It really pays to get your accountancy firm involved in your strategy right from the start. Your professional advisers understand the challenges you face and have experience of working with other companies in a similar position. They can also help you keep on top of deadlines and advise on the way in which you can streamline and improve your processes.